Billie Jean King is at the top of her game, having just won the US Open. Yet even though she is regarded as the best female player in the world, the male organisers reveal that her pay for the next season will be eight times less than her male counterparts. Angered by this, she decides to start her own tournaments made up of the best female players around. Meanwhile, former male number 1, Bobby Riggs, a man struggling with a gambling addiction, needs to make money and get his profile back so decides to throw down a gauntlet, saying that no woman could beat him on the court. The tennis match to end all tennis matches has been a fascination ever since it occurred, especially for documentary makers, including a 2013 film of the same name. This is the first time it has been dramatised and it is a real crowd pleaser. Directors Jonathan Dayton and Valerie Faris, who did such a good job with their 2006 indie hit and haven’t made a film since their 2012 Ruby Sparks, tackle the multi-layer story with huge confidence. This is a match that most will know the outcome, yet builds the story carefully so when the showdown does finally happen, it has you cheerings. This isn’t just a film about tennis or the empowerment of women but about hidden secrets. King, a married woman and a role model, finds herself drawn to a hairdresser, Marilyn Barrett, who becomes a very close friend to the tennis star. It’s a subplot that is handled with due care and attention. A tender and subtle love story that could have easily been overplayed but the direction and the script by Slumdog Millionaire writer Simon Beaufoy handles wonderfully. Meanwhile, as a parallel, Bobby Riggs is a man with his own demons. Living in a beautiful home and being supported by his much wealthier wife, Riggs has now fallen from grace as far as the tennis community is concerned and so plays with a group of males who are constantly finding weird bets for Rigss to lose money. His gambling habits are the brunt of his marital problems and he needs to find some way to stop. Yet being jeered on by his rich buddies, it becomes almost impossible for Riggs to refuse and so when mentioned about playing a tennis match against a woman, he steps up to the challenge and announces that he will beat any woman, gunning for King. The attention to detail, from the set designs and costumes to the choice of music is only helped by the cinematography. Using 35mm film, it has the grainy effect that a film from the 70’s had, so the directors haven’t just thrown this together. There is care in the overall viewing experience. Then we have the performances. The cast, made up of strong character actors, are all terrific, from Bill Pullman’s ageing male chauvinist president of the American Tennis Association, who believes that men are more exciting on the court, to Elizabeth Shue’s subtle, quietly reserved performance as Bobby’s wife. Andrea Riseborough, who is like a chameleon, managing to change her look with every movie, is great as Marilyn as is Sarah Silverman’s feisty Gladys Heldman, who helps King get the women’s tour off the ground. Yet it’s the leads who really steal the limelight. Steve Carell, with sideburns and glasses, looks identical to the real Riggs and manages to inject humour into a role that could be looked upon as sad and pathetic. Like his performance in Foxcatcher, it’s another opportunity to see Carell give a tremendous performance that looks effortless and yet is totally believable. Emma Stone, however, is magnificent. Capturing the moves and mannerisms of King, she makes this giant of the tennis world seem to humble and quietly unassured that you just can’t help but be on her side, whether it be on the court or with the personal problems she is fighting against. Could this be Oscar two for Stone? 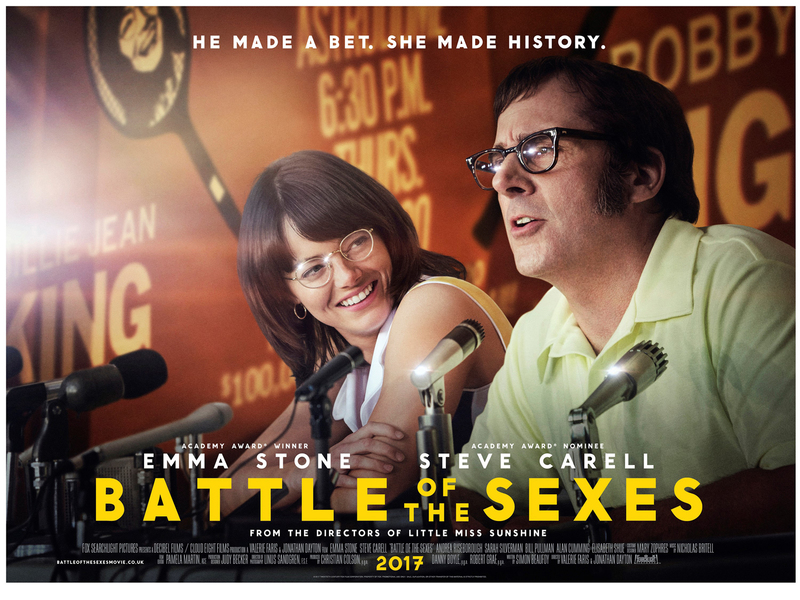 Battle of the Sexes is a terrific film that will have you laughing, crying and cheering by the end. It’s a perfect example of if you have a love for the story you are telling, you can make a terrific movie. With The Disaster Artist out next week, with both films about true events, it’s looking like it’s going to be a terrific year for the Awards season.